Rudely Stamped: "We Have No Important Enemies"
"We Have No Important Enemies"
"We have no important enemies. What we need to do is to begin to deal with the rest of the world as equals, and we don't do that. We spend more as a nation on defense than all the rest of the world put together. Who are we afraid of?" "We have a lot of goodness in this country and we should promote it, but never through the barrel of a gun. We should do it by setting good standards, motivating people, and have them want to emulate us. But you can’t enforce our goodness . . . with an armed force. It doesn’t work." There is a macabre yet popular style of Virginia license plate that features the slogan "Fight Terrorism." Above these words is a black pentagon with a section of the American flag inside, and imprinted on top of this the date 9/11; the "11" is formed using the outline of the World Trade Center towers that were infamously destroyed by airplanes that terrorists hijacked almost six years ago. Invevitably, these plates show up on some of the most expensive and luxurious German and Japanese vehicles sold in the Washington, DC metro area, and I always marvel at the juxtaposition of opulence with the morbid fetishism of one of the most horrific days in US history. "How's the fight going?," I'm often tempted to ask the drivers of these cars. I doubt I would get a coherent answer. An ill-defined and distant enemy who apparently has no ability to harm you on your home turf can't possibly focus the mind and stir the passions the way the shiny steel of a new sports car can. A year or two ago these cars would often feature a yellow "Support Our Troops" magnet as well, but now these emblems of convenience-store strength have all but disappeared. On one hand, if a war isn't finished before the bumper stickers fade or go out of style, it probably never will be; but on the other, if you're a driver who impulsively jumped on the jingoist bandwagon by slapping a magnet on your trunk, you should probably be forced to maintain it in full view for the duration. Once you've shown yourself to be a reckless hothead, the label should stick so the rest of us know who we're dealing with. "Stay the Course" ought to apply to wartime fashion statements, too. One institution that has not lost its militant fervor, however, is the San Diego Padres baseball club. 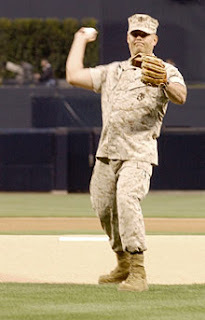 In attendance at one of the team's games a couple of weeks ago, held in one of the newest and most beautiful stadiums in the country, I was asked along with the rest of the crowd to rise in ovation to several hundred or more uniformed Marines who were on hand to watch some baseball. New recruits, they looked like. The usual platitudes about sacrifice and heroism were offered up as I seethed about the beautiful and bucolic sport of baseball -- America's pastime, we're told -- being enlisted in the cause glorified by the Virginia license plates. When it comes to outdoor entertainment on a beautiful spring day, we baseball fans have a right to expect our sport to be hermetically sealed off from all endeavors involving organized killing. As the ballpark crowd lavished frenzied applause on the honored guests, it was clear that several pertinent questions were being overlooked. Is it through the military that we want American youth to apprehend the wide world beyond our country? How will the experience transform these citizens and influence the trajectory of their lives? Do we taxpayers in fact get our money's worth out of paying to train and support these kids? And, indeed, who are we afraid of? Perhaps it was just an illusion caused by the verdure and fun of a baseball game, but it was hard to believe that any menace outside the stadium warranted such a national focus on brute force. Then the deplorable irony became clear: "America's Heroes", the vaunted Marines, had been given seats in the absolute worst part of the Padres' stadium. High up in the bleachers, far away from home plate, the soldiers sweltered in direct sunlight. They spent the afternoon sweating and squinting, while the rest of the crowd purportedly revered them from the cool shadows, enjoying a decidedly better view of the game on the field. Thank you for your post on my absurd realities blog. It is amazing how the powers that be do ignore Ron Paul. Everyone is showing their true colors now. I'm promoting the post on my blog.